In Naxos Island, only 30 metres from the beautiful beach of Saint George and at a very convenient point, Hotel Galini is one of the most hospitable accommodations of the area. 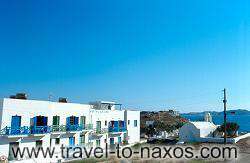 It is right next to all amenities, 300 metres fron Naxos Town center and a few metres away from the beach. The hotel is built according to the island architecture standards, with a touch of blue on white. Just enough to make you feel you are in a Greek Island. The view from the hotel is more than magic and there is nothing best and idyllic than watching the unique sunset from your own balcony. The atmosphere is very friendly and you will feel that your are a member of our family. The whole environment is tranquile to give you the relaxing moments you wish while in holidays. The rooms are spacious, extremely clean, with own bathroom, balcony or veranda, equipped with air-conditioning, satellite TV, hair dryer and direct dial phone. You are more than welcome to our hotel and we are sure that your holidays will be memorable.